—John Mauldin, Thoughts from the Frontline, 2001. When investors, financial professionals, and discerning citizens need a big-picture view of what’s going on in the economy, they turn to John Mauldin. And for good reason. John has dedicated more than 30 years to keeping people informed about financial risk. Thoughts from the Frontline began as John’s way of sharing his thoughts with a few associates. Some 16 years later, it is one of the most widely read investment newsletters in the world. From his warning of an impending recession in 2000, to a polemic on the Obamacare “death spiral” in 2016, John has blazed his own trail as one of the most respected macroeconomic minds in the field. In a variant on the Cheshire Cat, I would ask how you can know where you are if you don’t know where you came from. You and I have lived through the first nearly 14 years of this topsy-turvy century together, and many of its details as well as its overarching themes deserve to be recalled. But rather than offering you a dry, plodding recap of recent history, I’ve come up with a different and hopefully more fun way to revisit the past decade and a half. The plan was to take a short stroll through the history of my letters to get a feel for how our world and my thinking about it have changed over time. As it developed, Charley presented me with a rather voluminous package of excerpts, one far too long to send out as a Thoughts from the Frontline letter. So I will have to viciously edit myself to make the retrospective more consumer-friendly for TFTF readers. But for those who are interested, we are posting the entire summary here (and it will remain available here). If the Fed has to forestall deflation by printing even more money, we are clearly told it will do so. But eventually, History will weigh in. Inflation will come back much stronger than it would have if the dollar had remained one of the main mechanisms to fight deflation. This is the true implication of the problem with devaluing the dollar, as when inflation does come back, the Fed will raise rates to stop it, and thus bring on a serious recession. Think Volcker and 1980. We are between the proverbial rock and the hard place. Some of the changes were forced upon me. Some of them I willingly embraced. I have told my friends that I hope this is the last time I have to “reinvent” myself. I succumb to the fantasy that most investors have: that the trends of today will continue. And yet I know that this is not likely. The field in which I plow and reap is changing rapidly, and it is unlikely that in 10 years it will look the same at all…. Research was a visit to the library to pour through books, plus a few magazines and newsletters. Now I get scores of letters and articles every day delivered to my “mailbox,” plus an almost infinite amount of data at my fingertips using something called Google. I have almost five gigabytes of research and other articles from just the past few years stored on my computer, which I can search with a few strokes. To write a letter like this even ten years ago would take a week, after a month of research. Now I can access huge amounts of data each week, and I write the letter on a computer in about five hours on Friday afternoon…. Rumor has it that Kohn was Greenspan’s preferred choice to follow him. In any event, he is closely tied to Bernanke. I think it is highly likely that Bernanke shares [his] sentiments. But they are not nearly as hawkish as the speech on Thursday by new Philadelphia Federal Reserve President Charles Plosser. In a speech peppered with stern anti-inflation warnings, and echoing the sentiments expressed by Dallas Fed President Fisher (which we discussed at length about a few weeks ago), Plosser said the U.S. central bank’s very credibility was at stake when it came to keeping prices under control…. Quick aside: Ben Bernanke spoke this week, as well as Cleveland Fed President Sandra Pianalto. In addition to the previous two Fed members, they all acknowledged that the slowing housing market is a concern, but that the rest of the economy seems to be doing fine. Count them (at least publicly) in the slowdown and no recession camp…. The Fed has a very interesting problem. They acknowledge the economy is slowing, but at least publicly think the slowdown will be mild. If that is the case, then it may not bring inflation down below 2%, or even close. If that is the case, do they raise rates at some point next year as Plosser suggested, not just to maintain their credibility but to stave off inflation expectations? Central to their problem is the employment rate and consumer spending. Housing is definitely slowing down. At the height of the housing market, consumers (on a national basis) were borrowing almost 10% of their income as mortgage equity withdrawals. This cash-out refinancing added over 1% and maybe as much as 1.5% to GDP. Such re-financing has dropped to under 6% and looks like it is in freefall on the charts. Bernanke said in his speech that a slowing housing market could shave 1% off of GDP. GDP last quarter was 2.6%. Between housing and lower consumer spending due to less borrowing, it doesn’t take a lot to get that down to the 1% range. First, let’s look at the “rescue plan” as passed by Congress. As I pointed out last week, this is a bad bill. But it was necessary to pass something, and soon. Earlier this week I sent out a report that reviewed a study of 42 major baking crises. The conclusion: navigating them successfully depended upon quick action. The credit crisis happened because of Greenspan’s monetary policy. Or maybe it was a collective mania. Or any number of things. Just as the proverbial butterfly flapping its wings in the Amazon triggers a storm in Europe, maybe an investor in St. Louis triggered the credit crisis. Crazy? Maybe not. Today we will look at what complexity theory tells us about the reasons for earthquakes, tornados, and the movement of markets. Then we look at how the world and that investor in St. Louis are all tied together in a critical state. Of course, what state and how critical are the issues. We are going to start our explorations with excerpts from a very important book by Mark Buchanan called Ubiquity: Why Catastrophes Happen. I HIGHLY recommend it to those of you who, like me, are trying to understand the complexity of the markets. Not directly about investing, although he touches on it, it is about chaos theory, complexity theory, and critical states. It is written in a manner any layman can understand. There are no equations, just easy-to-grasp, well-written stories and analogies. To find out why [such unpredictability] should show up in their sandpile game, Bak and colleagues next played a trick with their computer. Imagine peering down on the pile from above, and coloring it in according to its steepness. Where it is relatively flat and stable, color it green; where steep and, in avalanche terms, ‘ready to go,’ color it red. What do you see? They found that at the outset the pile looked mostly green, but that, as the pile grew, the green became infiltrated with ever more red. With more grains, the scattering of red danger spots grew until a dense skeleton of instability ran through the pile. Here then was a clue to its peculiar behavior: a grain falling on a red spot can, by domino-like action, cause sliding at other nearby red spots. If the red network was sparse, and all trouble spots were well isolated one from the other, then a single grain could have only limited repercussions. But when the red spots come to riddle the pile, the consequences of the next grain become fiendishly unpredictable. It might trigger only a few tumblings, or it might instead set off a cataclysmic chain reaction involving millions. The sandpile seemed to have configured itself into a hypersensitive and peculiarly unstable condition in which the next falling grain could trigger a response of any size whatsoever. Something only a math nerd could love? Scientists refer to this as a critical state. The term critical state can mean the point at which water goes to ice or steam, or the moment that critical mass induces a nuclear reaction, etc. It is the point at which something triggers a change in the basic nature or character of the object or group. Thus (and very casually, for all you physicists) we refer to something being in a critical state (or use the term critical mass) when there is the opportunity for significant change. But to physicists [the critical state] has always been seen as a kind of theoretical freak and sideshow, a devilishly unstable and unusual condition that arises only under the most exceptional circumstances [in highly controlled experiments]... In the sandpile game, however, a critical state seemed to arise naturally through the mindless sprinkling of grains. Thus, they asked themselves, could this phenomenon show up elsewhere? In the earth’s crust, triggering earthquakes, or as wholesale changes in an ecosystem – or as a stock market crash? “Could the special organization of the critical state explain why the world at large seems so susceptible to unpredictable upheavals?” Could it help us understand not just earthquakes, but why cartoons in a third-rate paper in Denmark could cause worldwide riots? There are many subtleties and twists in the story ... but the basic message, roughly speaking, is simple: The peculiar and exceptionally unstable organization of the critical state does indeed seem to be ubiquitous in our world. Researchers in the past few years have found its mathematical fingerprints in the workings of all the upheavals I’ve mentioned so far [earthquakes, eco-disasters, market crashes], as well as in the spreading of epidemics, the flaring of traffic jams, the patterns by which instructions trickle down from managers to workers in the office, and in many other things. At the heart of our story, then, lies the discovery that networks of things of all kinds - atoms, molecules, species, people, and even ideas - have a marked tendency to organize themselves along similar lines. On the basis of this insight, scientists are finally beginning to fathom what lies behind tumultuous events of all sorts, and to see patterns at work where they have never seen them before…. But the longer we go on, asserts Minsky, the more likely and violent an “avalanche” is. The more the fingers of instability can build. The more that state of stable disequilibrium can go critical on us…. Chad Starliper sent me the following graph. It shows the debt-to-GDP ratio for the US, adding in various levels of debt. For instance, the ratio of debt to GDP for all levels of government debt is 87%. 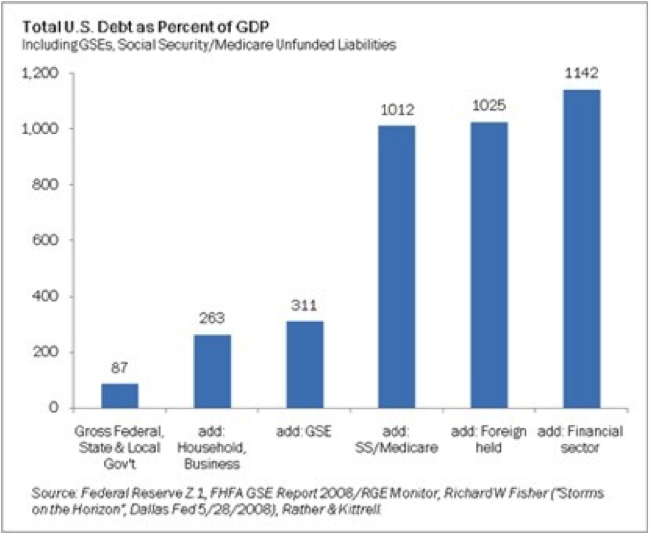 But if you add household and business debt along with the GSE (government-sponsored enterprises) like Fannie and Freddie, the ratio rises to 331%. And if you add in future benefits of Social Security and Medicare, the number becomes more like 1,000%. [H]ere is the issue for Europe. The amount of money needed for Ireland is going to be a lot more than they now think, or at least are willing to admit. When Eurozone politicians worry about “contagion,” or one country wanting the debt relief that another country gets, it is a very real worry. And rightfully so, as voters in Portugal or Spain or (gasp) Italy who are burdened by debt that is seemingly intractable will also want relief. It is not just an Irish condition, it is a human trait. From what I heard, Europeans banks are worse than even the dire reports you read in the papers. Spreads are widening and liquidity is drying up. Drexia is the tip of the iceberg. I really have to wonder how much France can do in regards to its bank debt. Will the ECB lend them enough money? The answer is yes. But we are talking a great deal of debt for a country with serious fiscal deficits and where government spending is already 55% of GDP, with rising healthcare and pension costs. Think French politicians will try and get their unions and public workers to take a 15% pay cut? The French will not be civilized and stoical, like the Irish. They will take to the streets. As I outline in my book Endgame (shameless plug), each country has to find its own path. But it’s clear that Spain, like Greece, is simply going to have to default on part of its debt. So will Ireland and Portugal. Japan will resort to printing money in amounts that will boggle the imagination and terrify the world as they finally come to grips with the fact that they must deal with their deficit spending. If a compromise is not crafted in 2013, how will one be crafted in 2014, which is an election year? 2015 may be too late, as the bond market will watch Europe and Japan implode and wonder why the US is any different. Remember, the event horizon is determined by the confidence of the bond market in the willingness and ability of a country to pay its debts with a currency that has a value that can be maintained. Trillion-dollar deficits for the next three years will call into question the value of the dollar. That will mean higher interest rates, which will mean a much bigger, more deadly black hole. I should note that something similar to the glide path was tried during the Clinton administration. Spending growth was controlled, and the economy was allowed to grow its way out of debt. While the US economy is fundamentally weaker today than it was then, it should be possible for the US free-market economy to once again become an engine of growth. I think the analogy of an Economic Singularity is a good one. The Black Hole of Debt simply overwhelms the ability of current economic theories to craft solutions based on past performance. Each country will have to find its own unique way to achieve escape velocity from its own particular black hole. That can be through a combination of reducing the debt (the size of the black hole) and fostering growth. Even countries that do not have such a problem will have to deal with the black holes in their vicinity. As an example, Finland is part of the eurozone and finds itself gravitationally affected by the black holes of debt created by its fellow Eurozone members. And China has recently seen its exports to Europe drop by almost 12%. I would imagine that has been more or less the experience of most countries that export to Europe.